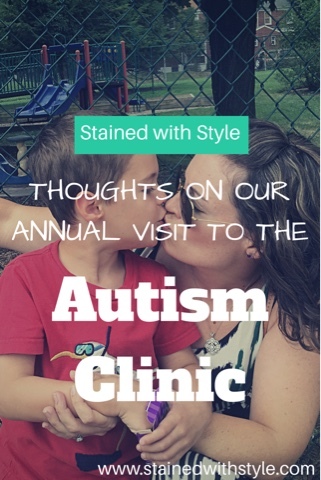 Monday was our annual visit to Johns Hopkins Autism clinic. It is always a hard, long day for all of us. The appointment starts at 9 am and sometimes can go until 5 pm. We answer tons of questions about R3, and talk about the things that he can and can't do. He also had an in depth evaluation by a different doc than we usually see. It's called a neuro/psych evaluation. Usually, we would just check in with his developmental pediatrician. Like every parent of a differently-abled child, I hate these visits. I hate the reminders of all of the things that he can't do. Believe me, I feel it in my heart every day. We choose to focus on my he things that he CAN do. This child is a blessing. He is lovely, sweet, so tender hearted, and kind. When I answer all of the zillion questionnaires and they ask things like, does your child intentionally hurt people or animals, or does he play with feces, I am reminded how lucky we are. Things could be so different, and are so different for so many families. On the other hand, everyone there knows how to talk to him. When you have a child with communication issues, it can be a challenge with people who aren't aware. You can't necessarily ask him a question without making sure he is paying attention. He may not hear you. He isn't ignoring, he needs a bit...extra. They know that. EVERYONE gets his attention before talking to him. They get it. There is no question about a kiddo behaving oddly. It doesn't matter and doesn't even warrant a second glance from anyone, not a janitor, not the security staff. I love that. We don't have to explain that he's just a little bit different. STANDARD FTC DISCLOSURE: In order for me to support my blogging activities, I may receive monetary compensation or other types of remuneration for my endorsement, recommendation, testimonial and/or link to any products or services from this blog. Please note that I only endorse products that are in alignment with Stained with Style's ideals and that I believe would be of value to my readers. Stained with Style is a participant in the Amazon Services LLC Associates Program, an affiliate advertising program designed to provide a means for sites to earn advertising fees by advertising and linking to Amazon.com. Stained with Style is also a participant in the Ting, Instant Pot and Nordstrom affiliates programs.